Get the party well and truly started with a collins303 party mash up mix! These mixes feature big tunes from across the genres – mixed and spliced to perfection. 2 hours of classic old skool house and indie anthems recorded live at a wicked party in Amsterdam in 2009. THIS IS PIRATE! 41 chill out tracks in 80 minutes - yes, its another Full Flava Behaviour mix :) Purists beware! 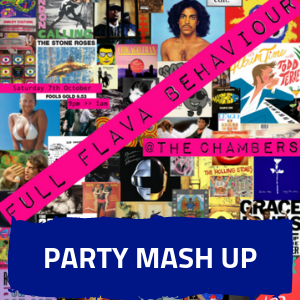 A tonne of classic tracks in a balearic funky hip hop mash up stylee…The first in a legendary series of master mash up party mixes! An absolutely HUGE mash up of old skool funk, hip hop, block party breaks and original loops. If you like it funky, get on this mix immediately!